For someone trained in the common law — inherited from the British tradition, working in the records of the civil law is like working in a foreign country. 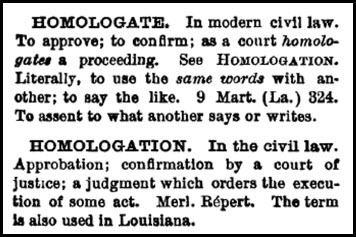 Not only are the records sometimes in a foreign language — it’s not at all uncommon to have civil law records from Louisiana in French — but even when the document itself appears to be written in English, the terminology may be utterly different. So a homologated succession is a court-approved estate document, likely an order that something be done. Sigh… The language of the law. Part Latin, part Anglo-Saxon, all confusing. I love all those words in the English language that come from Latin or French. They are easy for me to decipher. But I am still very careful as some of them can be des “faux-amis” (bad friends!). Lived in Louisiana for a few years and its a horse of a different color for sure. It just might be the Quebec of the U.S. In the 50’s a lot of our neighbors spoke French or some call it Cajun and they do have some strange laws. Try the historical Scottish legal system! Its a true delight once gets into it, but the terms are certainly different. And when you can’t find deeds in La., look for the “Conveyances.” 🙂 Interesting, I haven’t come across “curators” yet (though I ‘ve only scratched the surface w/my La. ancestors’ court records), but I have relatives who had a tutor and an undertutor (the back-up tutor). A couple of girls in one family eventually married their tutors (making one wonder exactly how “disinterested” a party each tutor was)!